Porteus Kiosk is released as a standalone 'hybrid' ISO image which can be burned on a CD/DVD or any other bootable media including usb sticks, hard drives, SSD/eMMC devices, removable SD/MMC cards, etc. Windows/Mac users can burn hybrid ISO to a flash device using special applications such as Win32DiskImager. Users have reported that some burning programs are not compatible with Porteus Kiosk (e.g. Rufus or UNetbootin) so if booting fails then please use Win32DiskImager which is proven to work. where 'dev/sdb' is the target device. Note that above command will disable any other bootloaders, overwrite all existing data on this device, and it will not work if you specify a partition number (e.g. /dev/sdb1), as 'dd' must start writing to the Master Boot Record of the device itself. Once you have executed this command, the drive will be bootable - no further steps are required to complete the installation. Download the Kiosk ISO and burn it to a CD or DVD as an ISO image file using your favorite CD burning software. Most CD/DVD creation software has this function. Please be aware that this is not the same as simply burning a file to disk or creating a 'data disk'. The end result should not be a disk that contains the .iso file, e.g.'Porteus-Kiosk-3.1-i486.iso'. The end result should be a disk that contains three folders: boot, docs and xzm. If your software doesn't have this option, try downloading and installing a free application such as ImgBurn. 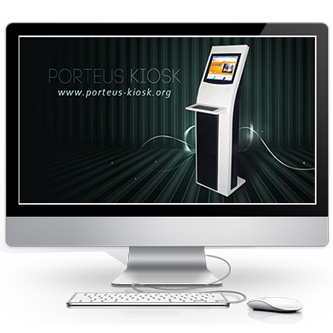 NOTE: Since 4.0.0 release Porteus Kiosk can be used on 64bit PCs only. If your PC is 32bit then last release for this architecture can be downloaded from this link: Porteus Kiosk 3.7.0. NOTE: Porteus Kiosk works with Intel/AMD processors only. Raspberry Pi and other ARM based platforms are currently not supported. Full hardware requirements of our operating system can be found under this link. Our systems are available for free. If you are a company and uses them for commercial purposes then please donate to help us keeping this project independent and offered free of charge to everybody. If you are a public institution or a private person and still like the job we do then please donate if you can - it's very much appreciated. Donations are made anonymously, sender details are not published or shared. If you are willing to donate but dont have a PayPal account then you can use your credit or debit card. In such case please use PayPal buttons below then click on a "Donate with a Debit or Credit Card" button and provide all required details to make the transfer happen.